Lines from Linderhof: Let The Good Times Roll! It's almost the end of the pre-Lenten season. Ash Wednesday is this week! We've had a "Mardi Gras" party at church on Sunday -- with some great Cajun appetizers and big bowls of chicken gumbo. Tomorrow The Lunch Bunch plus one will lunch on red beans and rice and bread pudding. I made some cookies for a take home favor. A few extra, for myself, for tea. The snow stopped mid morning but it was a "winter wonderland" as I took tea this afternoon. My tea treat? "Mardi Gras" cookies. Cutout cookies frosted and sprinkled in Mardi Gras colors and shapes. Green masks, gold crowns and purple fleur di lis! It's Tuesday and I'm sharing my Mardi Gras tea with Sandi at Rose Chintz Cottage for Tea Time Tuesday and with Bernideen for Friend Sharing Tea. And tomorrow . . . . Let The Good Times Roll! 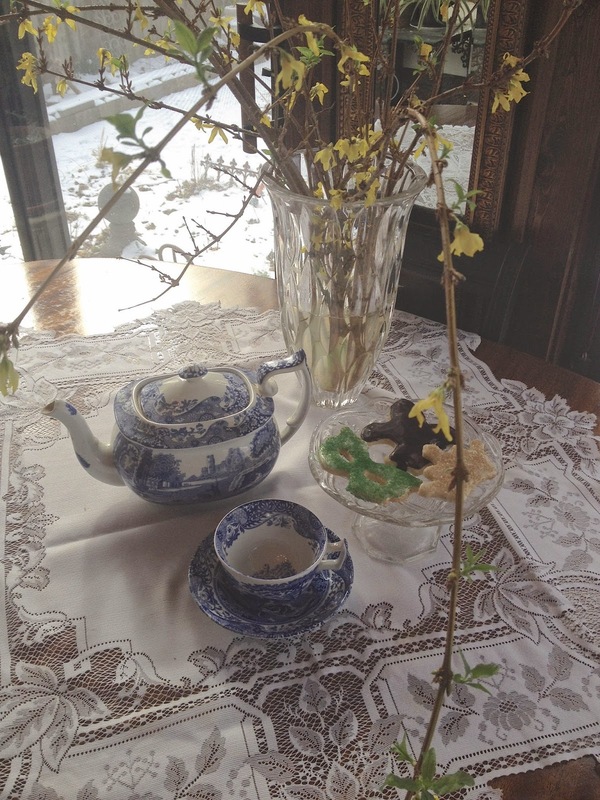 Love your blue transferware teapot and teacup. The Mardi Gras cookies are so cute! Sounds like you had a wonderful time at the Tea, Martha. I absolutely love your teapot. What a lovely shape! Hubby would like those cookies. Me, I am craving bread pudding now! Thanks for sharing and joining me for tea today. You have become quite the talented cookie decorator. 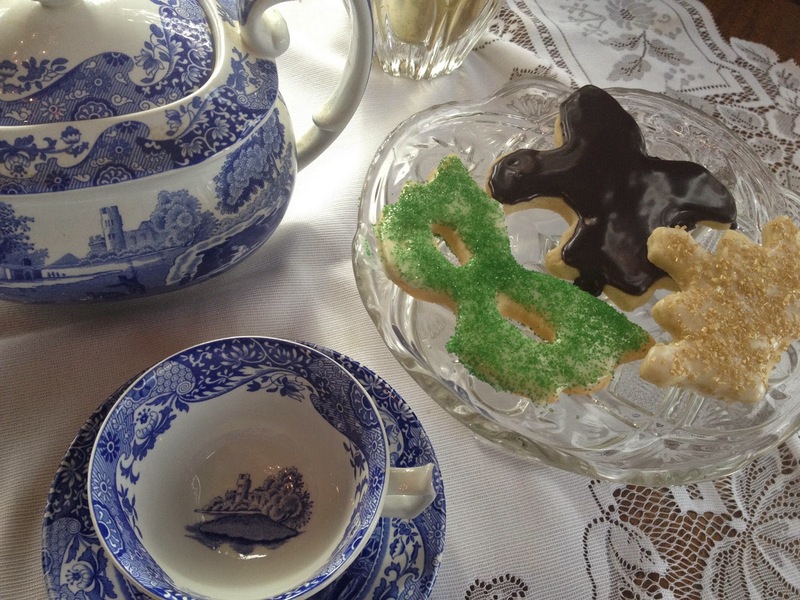 I love the creative choices you made here and always your teaset is a delight to see! Beautiful blue and white transferware, my favorite! The cookies look festive and yummy too! Your cookies are so perfect for Fat Tuesday/Mardi Gras! What a wonderful Mardi Gras treat, Martha. Your cookies look so pretty and I'd love one with a cup of tea. Let the good times roll! Cute cookies. Lovely blue and white transferware. Happy Tea Day! 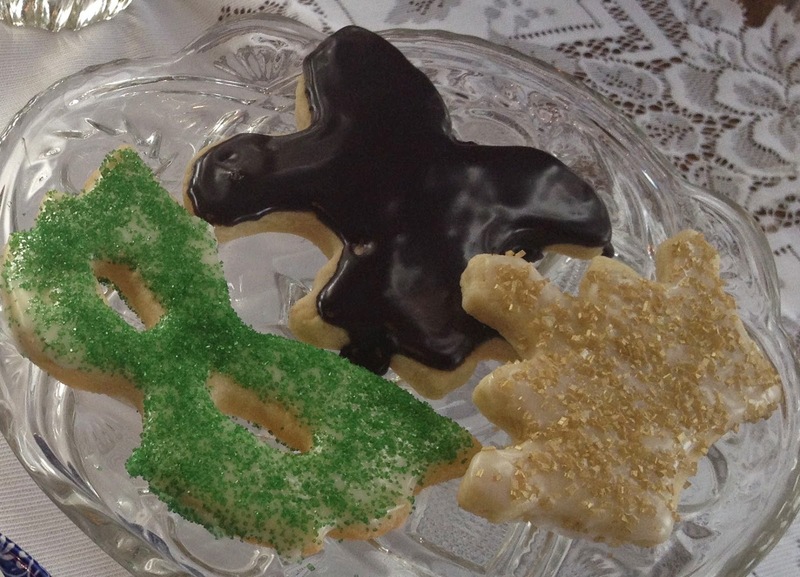 Love your mardi gras cookies! So cute! Must have been a great gathering! Wonderful! I've never seen a cookie cutter like a mask. Love your forsythia blossoms.